50 | TH E M R EP O RT SERVICING THE LATEST O R I G I NAT I O N S E R V I C I N G DATA G O V E R N M E N T S E C O N DA R Y M A R K E T Report: Mortgage Servicing Industry Needs Updating The Urban Institute released a report calling for an update to the mortgage servicing to make it easier for creditworthy borrowers to get mortgages. T he Urban Institute released a report at the start of February calling for an update to the mortgage servicing industry to make it easier for creditwor - thy borrowers to get mortgages. The report, written by Institute experts Alanna McCargo and Laurie Goodman, said mortgage servicers were historically a "be- hind-the-scenes" component of the housing and mortgage industries until the 2008 financial crisis. "After the 2008 housing crisis, servicers were thrust into the spotlight as an unprecedented number of borrowers started hav- ing trouble paying their mortgages and entered foreclosure," McCargo and Goodman said. "In response to the crisis, federal agencies cre- ated new regulations designed to help servicers quickly resolve and minimize homeowner losses." While many of these measures were helpful during the crisis, stabilizing mounting losses and establishing needed standards, they remain on the books today, even while delinquency and fore- closure rates have stabilized from crisis levels. McCargo and Goodman said despite the drastically changed regulatory scheme, much of the servicing side remains unchanged, including the way servicers are compensated. 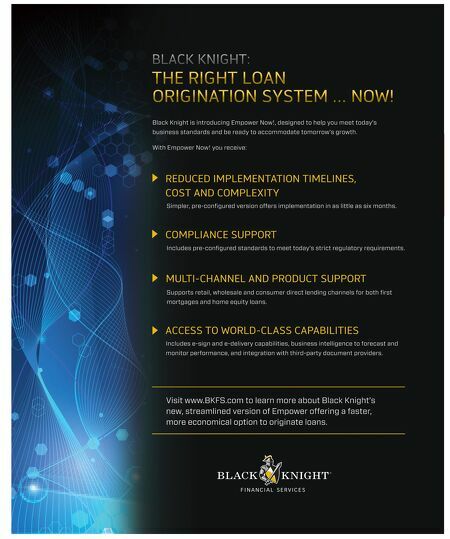 "In recent years, we have witnessed the rapid growth of nonbank servicers, which manage more than half the nation's mort- gage loans and have introduced new regulatory, risk, and capital questions that have not been fully addressed," they said in the report. "New servicing business models have also emerged, with subservicing and specialized servicers entering the market and many traditional servicers exiting the market." Several high-profile companies have exited the servicing industry since the 2008 crisis. Most recent- ly, Citimortgage agreed to a deal with New Residential Investment and Nationstar Mortgage to trans- fer its servicing rights to 780,000 mortgages, marking its exit from the servicing sphere. "The financial crisis revealed the housing finance system's vul- nerability as well as the centrality and general underappreciation of the role of mortgage servicers, who manage over $10.2 trillion in single-family mortgage servic- ing outstanding nationally," they said. "The viability, liquidity, and stability of servicing over the long term are critical and must be part of the conversation about how we comprehensively reform our housing finance system." Cam Melchiorre, President and CEO of HOPE Loan Port, said the industry needs to develop more programs to assist cus- tomers in getting back into the market. "The purchase market is still constrained because of the regula- tory drag, tightened eligibility guidelines, and lack of inventory," he said. "The mortgage finance industry needs to redouble its efforts in a collaborative way to assist consumers who seek homeownership. Additionally, many prospective homeowners emerged from the financial crisis with credit blemishes, especially those with modifications, short sales, deeds-in-lieu, and foreclo- sures. The industry should also have more programs to remediate those consumers and facilitate their return to the market." 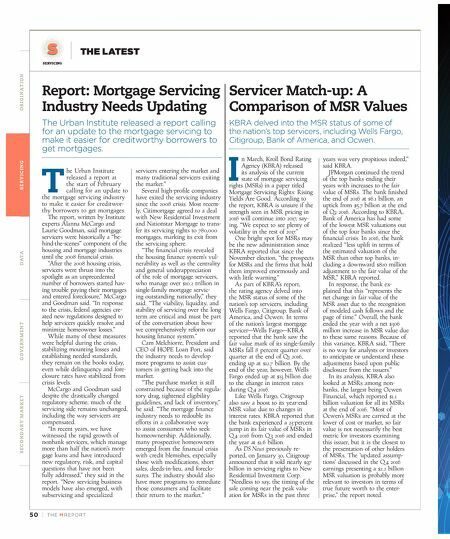 Servicer Match-up: A Comparison of MSR Values KBRA delved into the MSR status of some of the nation's top servicers, including Wells Fargo, Citigroup, Bank of America, and Ocwen. I n March, Kroll Bond Rating Agency (KBRA) released its analysis of the current state of mortgage servicing rights (MSRs) in a paper titled Mortgage Servicing Rights: Rising Yields Are Good. According to the report, KBRA is unsure if the strength seen in MSR pricing in 2016 will continue into 2017, say - ing, "We expect to see plenty of volatility in the rest of 2017." One bright spot for MSRs may be the new administration since KBRA reported that since the November election, "the prospects for MSRs and the firms that hold them improved enormously and with little warning." As part of KBRA's report, the rating agency delved into the MSR status of some of the nation's top servicers, including Wells Fargo, Citigroup, Bank of America, and Ocwen. In terms of the nation's largest mortgage servicer—Wells Fargo—KBRA reported that the bank saw the fair value mark of its single-family MSRs fall 8 percent quarter over quarter at the end of Q1 2016, ending up at $12.7 billion. By the end of the year, however, Wells Fargo ended up at $13 billion due to the change in interest rates during Q 4 2016. Like Wells Fargo, Citigroup also saw a boost to its year-end MSR value due to changes in interest rates. KBRA reported that the bank experienced a 23-percent jump in its fair value of MSRs in Q 4 2016 from Q 3 2016 and ended the year at $1.6 billion. As DS News previously re - ported, on January 30, Citigroup announced that it sold nearly $97 billion in servicing rights to New Residential Investment Corp. "Needless to say, the timing of the sale coming near the peak valu - ation for MSRs in the past three years was very propitious indeed," said KBRA. JPMorgan continued the trend of the top banks ending their years with increases to the fair value of MSRs. The bank finished the end of 2016 at $6.1 billion, an uptick from $5.7 billion at the end of Q2 2016. According to KBRA, Bank of America has had some of the lowest MSR valuations out of the top four banks since the financial crisis. In 2016, the bank realized "less uplift in terms of the estimated valuation of the MSR than other top banks, in - cluding a downward $820 million adjustment to the fair value of the MSR," KBRA reported. In response, the bank ex - plained that this "represents the net change in fair value of the MSR asset due to the recognition of modeled cash follows and the page of time." Overall, the bank ended the year with a net $306 million increase in MSR value due to these same reasons. Because of this variance, KBRA said, "There is no way for analysts or investors to anticipate or understand these adjustments based upon public disclosure from the issuers." In its analysis, KBRA also looked at MSRs among non - banks, the largest being Ocwen Financial, which reported $1.1 billion valuation for all its MSRs at the end of 2016. "Most of Ocwen's MSRs are carried at the lower of cost or market, so fair value is not necessarily the best metric for investors examining this issuer, but it is the closest to the presentation of other holders of MSRs. The 'updated assump - tions' discussed in the Q 4 2016 earnings presenting a $2.2 billion MSR valuation is probably more relevant to investors in terms of true future worth to the enter - prise," the report noted.